There had to be nine of these. Never in my wildest dreams could I have imagined everything that would happen to me over the course of six NIN/JA shows. They were highly anticipated, with expectations through the roof, and I was still blown away. I made new friends, crossed about five things off my bucket list, saw some of the best sets of my life, and, ultimately, found myself again. What does that mean? I started a new chapter in my life- one that won’t be easy, but is necessary. 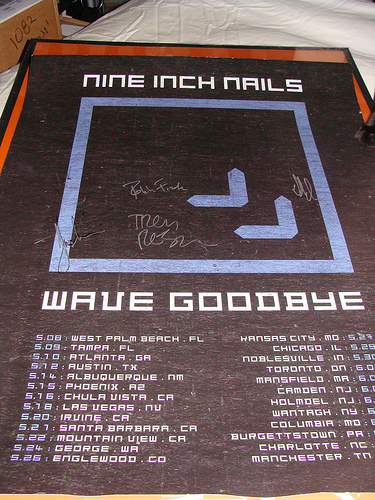 Before the tour started, I chatted with several NIN fans separately about their hopes for this final tour. Almost all of them had never met the man. Despite years of following, many of us had never been lucky enough to say thank you in person. I think all of us were able to fulfill this wish, and help save a life along the way. Over the course of my six shows, I think I met everyone in all three bands, plus a lot of the crew. Every single person was as nice as can be. I can’t imagine what it would be like to meet your idols and have them turn out to be assholes. Well, I met all of mine, and they only made me love them more. This tour also made me realize how much technology is a part of my social life and aspiring career as a rock journalist. NIN : Access, Twitter, SMS, WordPress, YouTube, Flickr, NIN.com forums…..they all propped up my experience with the tour and allowed many of my experiences wouldn’t have happened without their existence. There was only one thing that I expected that went unfulfilled- NIN + JA collaborations. I’m not sure why, but there is probably a good reason. I also realized that vlogs aren’t for me. I’m cool to record bits and pieces of the shows, but I just can’t talk on camera very well…especially right after a set. With that, I would like to go through the highlights that occurred over the course of my own little NIN/JA tour. – Arriving at 7am in to be the sixth person in line. I fully expected lots more people. – The line cutters, and using NIN:Access to rat them out to the NIN camp, where JT came out and immediately booted them. – Being completely smashed in the pit up against the rail, and I’m pretty sure the guy behind me had an erection, and put his hand around my waist, but I was so packed in and tired I couldn’t do anything about it. – A crowd surfer fell on my head during Jane’s- was bound to happen someday! – Lost in NJ w/ bluelily425– from Philly to Camden, Camden to Philly, Philly to Brooklyn, Brooklyn to Holmdel, and Holmdel to Brooklyn. All GPS failure, and full HRC meltdowns. Were you there? Please leave comments and let me know about your highlights from the shows- I’d love to read them! NIN driven into my heart! big love and bigger better faster more. The most memorable moment for me was getting lost during Jane's set at Shoreline and being unable to find my way back to my seat, so I started playing musical (mua!) chairs. I got kicked out of around three chairs before I found a nice peaceful place directly behind a couple of girls who were smoking roughly their weight in weed. Maybe that's why I enjoyed Jane's way more then I thought I would. I left feeling quite, uh, at ease with the world. ….that's a story that doesn't hold a candle to any of yours, so I'm glad for this blog. I'll say my favorite stories of YOURS are the stalking one and the tall/short photos. Comedy gold. We had a conversation prior to this odyssey and you expressed some concern about how “practical” (for lack of a better term) spending so much time and money would be on this quest. It all came down to it being about life experiences versus pragmatism. I'm glad adventure won out! Great stuff. Where was I? Where I still am – in Europe, far away from everything. Yet, thanks to Internet and technology and above all everybody who has been and still is generously sharing the experience through words and pictures I've been able to follow this tour from the very first concert, through YouTube, Twitter, blogs etc I've been a distant participant. What a blast we had this time around! It was great hanging with you in Vegas and I now have so many memories of that show that include you! We'll have to do this again really soon. The only question is….who do we follow this time? And Kim- I'm sure we'll find someone to follow…it won't be the same, but I'm sure we can have some fun with it! Unfortunatly for me, I decided to donate for Toronto..where there were about a million people ready to meet Trent, so I don't think I got the full experience, but the meeting was still worth all the money.